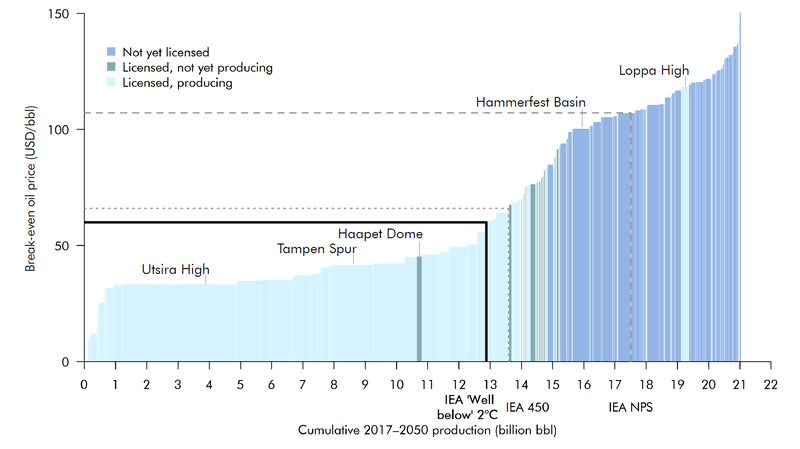 This discussion brief examines the implications of the Paris Agreement, and Norway’s own pledges under it, for future oil production, considering the break-even cost per barrel of developing different fields. Down, A. and P. Erickson (2017). Norwegian oil production and keeping global warming ‘well below 2°C’. SEI discussion brief. Stockholm Environment Institute, Stockholm. As part of the Paris Agreement, world leaders agreed to work to keep global warming “well below” 2°C above pre-industrial levels, aiming to avoid the most dangerous impacts of climate change. This requires rapid and sustained action to reduce greenhouse gas emissions. Yet even as countries seek to reduce fossil fuel consumption to reduce emissions, investment in fossil fuel production is expected to grow. The divide between climate goals and fossil fuel-sector investment is particularly evident in Norway. The country’s Intended Nationally Determined Contribution (INDC) under the Paris Agreement establishes a target of reducing domestic emissions by at least 40% from 1990 levels by 2030 and a “binding goal” of becoming a carbon-neutral “low emission society” by 2050. However, Norway also expects to continue producing significant volumes of oil and gas for decades. 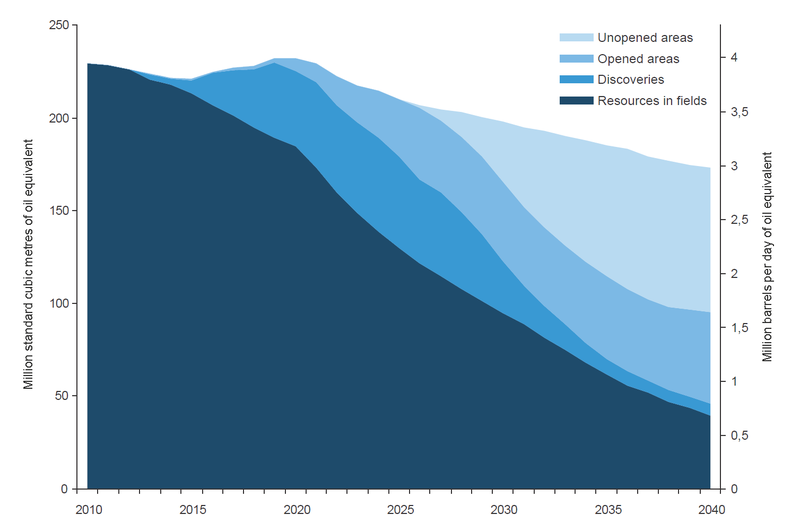 The Norwegian Petroleum Directorate (NPD) has stated that it will be possible to “maintain production from the [petroleum] sector at a very high level for decades to come”. Indeed, the Ministry of Petroleum and Energy and NPD have projected only a slight decline in oil and gas production through 2040. Fossil fuel production now accounts for over a quarter of Norway’s domestic GHG emissions. Those emissions are covered by the European Union’s Emissions Trading System (EU ETS), so there are ways to offset continued emissions through deeper reductions elsewhere in the EU. Still, meeting Norway’s long-term goal of becoming a low-emission society will require steep emission reductions in the sector – either through reduced production or by lowering the emissions intensity of production. Furthermore, fossil fuels produced in Norway and exported to other countries will still contribute to global GHG emissions when combusted. Several analyses have shown that when a country increases its oil production, the increase is not fully offset by reduced production elsewhere – and when global oil production increases, so do oil consumption and overall CO2 emissions. This briefing paper examines what a “well below-2°C” scenario might mean for future oil production in Norway. Such a scenario would clearly entail lower levels of global oil demand than under business as usual, which would likely cause oil prices to be lower as well. 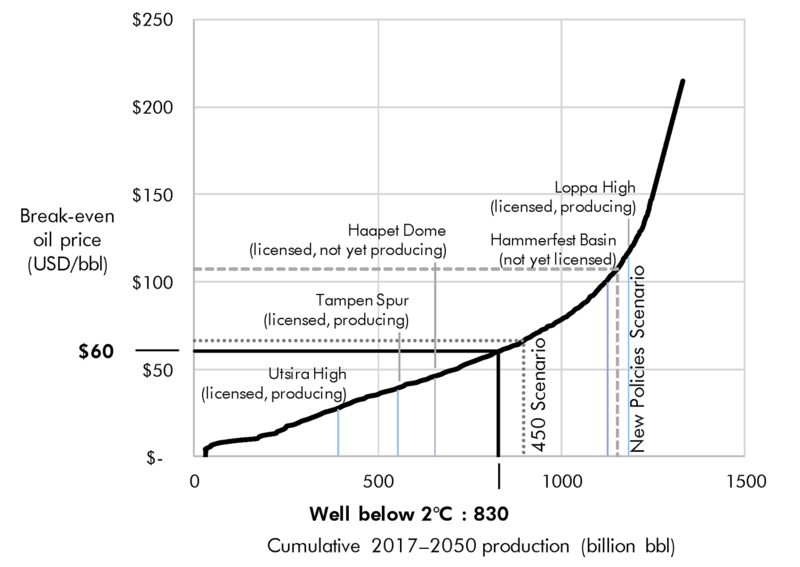 The authors consider which oil resources would still proceed (or continue producing, if already developed) in this lower-price environment consistent with a 2°C climate scenario. The analysis shows how policy-makers in Norway could apply a “climate test” – checking for consistency with a 2°C scenario – as part of the decision-making process on whether to open additional areas for drilling.